There are a lot of different ways to go about making money online (which is part of the reason why it can be so overwhelming if you are just getting started), and membership websites are a favorite of many online marketers. With a membership site you’ll offer some sort of content, products, or services exclusively to people who have paid to get access to your site, and it will also involve a recurring payment in order for the membership to stay active. There are a lot of reasons to like the membership model, which we’ll get into in just a moment, but I think it’s important to take a balanced look at the subject because there are also some significant challenges to having success with a membership site. I started and managed a membership site several years ago and eventually sold it. I’d like to share the things I learned along the way so you can decide if a membership site is the right move for you. This is a rather long, detailed article, so you may want to bookmark it if you don’t have the time to read it all now. You can also get a PDF version of the article by using the social sharing buttons below. When it comes to membership websites there are actually several different types, but they typically all get lumped together in one big classification. The point of this section of the article is to show that there are some options when it comes to starting and managing a membership site. Here we’ll look at a few of the most common types of membership sites, but I’m sure there are plenty of other possibilities, and with some creativity you could probably come up with a few other ideas. Probably the most common type is the content-focused membership site. With this type of site members would pay an on-going fee (often a monthly or yearly fee) in order to get access to some sort of exclusive content or information. In some cases this content is presented as a course, and could be in text, audio, or video format. 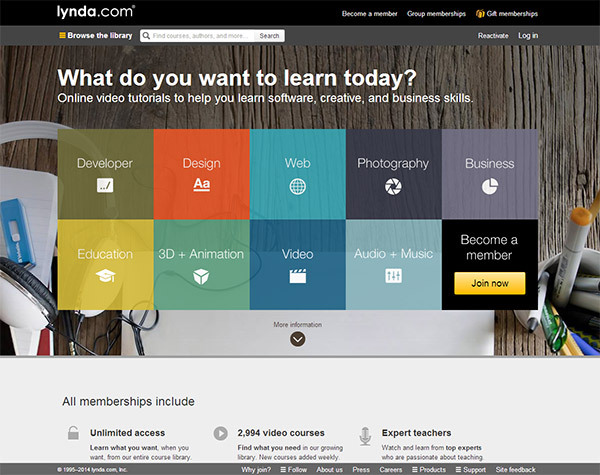 One example is Lynda.com, where anyone can sign up and pay a monthly or annual fee to get access to educational videos that will teach you subjects like design, coding, photography, and business. There are countless forums online, and you can find forums focused on just about any topic you can imagine. Most forums are open to anyone, visitors just need to create a free account in order to start participating. But some forums are private and protected only for paying members. Members may pay a monthly or yearly fee in order to have access to read forum threads and to participate. An example is Stack That Money, a members-only forum focused on all things related to affiliate marketing. This type of site provides paying members with various digital products or resources that they can download. Typically, new products or resources will be added regularly in order to encourage members to remain active. Members may pay a monthly or yearly fee in order to be able to login to the site and download the products. There are a few different types of example that you may be familiar with. A lot of WordPress theme shops offer a membership option so customers can pay a monthly or yearly fee to get access to all of their themes. Elegant Themes was one of the pioneers and many other sites have adopted this model as well. At Elegant Themes you can pay a yearly fee and get access to more than 80 different WordPress themes. Many stock photography sites also offer subscriptions. So if you frequently buy stock photos you can sign up for a subscription that will give you a specific number of downloads each month for a set monthly fee. Another example is WeGraphics, where designers can pay a monthly or yearly fee in order to be able to download any and all of their products. Since they add new products on a regular basis the value of that membership is always increasing. This type of site is somewhat similar to info/content/course membership sites, but with a little bit of a news-related twist. Members would pay an on-going fee to get access to a site where they will get insider access to news/reporting/gossip/rumors of some type. There are a few examples of this from the sports industry. 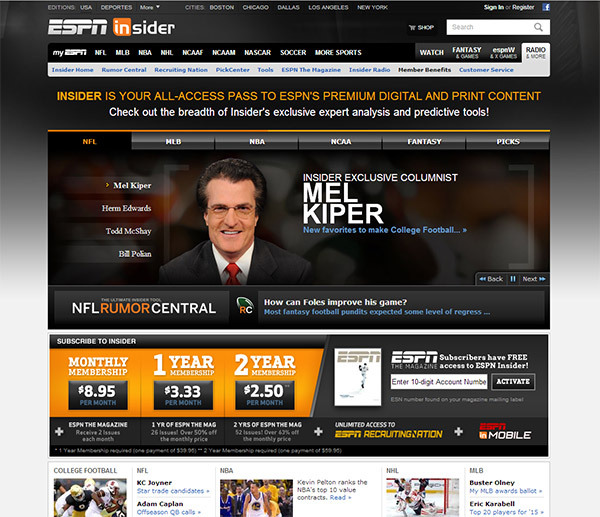 ESPN Insider gives members access to “exclusive expert analysis and predictive tools.” Another sports example is Rivals.com, where you can pay a monthly or yearly fee to get insider access to things like recruiting news related to your favorite college football team. Websites can also be set up to promote services on a membership basis. Members would get access to some sort of service in exchange for a monthly or yearly fee. An example is WP Curve, which provides members/customers with WordPress support and assistance for a monthly fee. You may have read or heard respected marketers recommending membership websites as a great way to make money online. Here is a look at some of pros of owning or managing a membership site. By far the biggest reason to love membership sites is the on-going or recurring revenue. Instead of selling a product and collecting a one-time payment from a customer, with a successful membership site you will be getting paid every month or year (or at another interval) as long as that member is active. If customers have a compelling reason to keep their membership active and keep paying those fees, the value of the average customer can be quite high. Another reason to love membership sites is because they can offer a great level of predictability or stability of income. As your site grows and you build a solid base of paying members you will be able to calculate stats like your retention rate, so you will have a pretty good idea of how long the average member will stay active. You can also calculate the average number of new members that sign up per month. With this info you can fairly accurately predict how much revenue your site will generate month-to-month. While membership websites do present opportunities for recurring income and potential for high income, they are typically very challenging in the early days, weeks, and months. Unless you have an existing platform (such as an established blog or a large email list) that you can use to promote your membership site, getting new members can be quite a challenge at first. However, the recurring income makes it very realistic for you to be able to consistently grow that income over a period of time. If you’re able to get new members to sign up at higher rate than your current members are canceling, your income should be on a pretty consistent increase. With the necessary work and effort, a membership site is one of the best models for having a steadily increasing income through a website. The fees charged by membership sites will obviously vary from one site to the next depending on the details of what members are getting, and the audience that is being targeted. But in general a site that retains a member for at least 6 months to a year will earn a higher amount of revenue per customer than would be possible through selling a comparable product with a one-time fee. One of the best ways to increase your income through an online business is to focus on increasing the amount that you earn from each customer, rather than simply trying to reach more new customers. A membership website makes this possible through the retention of paying members, and even through upgrading them to higher-cost membership levels. So based on the last section there are some really powerful reasons to love membership websites. Who wouldn’t want recurring income from customers? However, I learned during my time with a membership site that there are also some significant challenges or drawbacks, and a lot of times I think they get ignored when the topic of membership sites is discussed. I learned some things the hard way, and so I’d like to discuss come of the challenges in case they can help you. Probably the biggest lesson I learned from running a membership site for a few years is that most people simply do not want to sign up for recurring payments. Of course customers are willing to sign up for a recurring payment in the right situation, but the offer needs to be very compelling and they have to see an obvious benefit to having that membership. People just don’t like to idea of committing to a payment every month or year, even if it can be canceled. Most people worry that they will forget to cancel and will be charged for something that they don’t want or use. From my experience of selling very similar products, and in some cases identical products, on a membership basis and also on a one-time payment basis, it is much easier to sell products that only involve a one-time payment. This means that you’ll have to work hard to create value for your members, and keep working to avoid having them cancel. If your membership site provides some sort of info or content to members, or if it provides some sort of products or resources, there will be a constant need for adding new material in order to retain your members. If someone signs up and then sees that you are never updating the site or providing new members-only content, they are very likely to cancel the membership. In order to have success with your membership site you’ll need to maximize your retention rates and keep members for as long as possible. This means that you’ll have to dedicate a great deal of effort (or money) to make sure that the site continues to offer value to your members. Some people may look at the recurring revenue of a membership site and see it as a form of passive income that will continue to bring in money with very little effort on your part. My experience couldn’t be further from the truth. I found having a membership website to be a a very time-consuming way to make money, although that is not to say that it wasn’t worth the time. One exception to this is if you have some sort of course where content is drip fed so that members will only be able to access certain content based on how long they have been a member. For example, you could set up a twelve-part course where members sign up for monthly payments that will last for one year, and then each month they get access to a new module or chapter of the course. If they want to get access to all of the content they will need to keep their membership active for the full year. With this type of setup you could do it all in advance and it would be possible to generate some passive revenue, but once your member completes the one year they have no reason to keep their membership active unless you have some other benefit for members. When I started my membership site I had an established blog with a large audience that I used as a platform for getting new signups. Even with that advantage I still found growth during the first year to be slower than I anticipated. Many other membership site owners that I have talked to over the past few years have had a similar experience where establishing a sold base of paying members has been more difficult than expected. The reason I point this out is not to discourage anyone from starting a membership site. Instead, I’d rather have you mentally prepared to need to put in a lot of work, and have some patience, in order to make it work. If you have realistic expectations and you are willing to keep working even when you are not seeing a lot of growth you will be far more likely to ultimately succeed in the long run. One of the biggest surprises for me was the rate of failed recurring payments. I used PayPal for processing the recurring payments, mostly because it is easy to set up and doesn’t require a merchant account or collecting or storing credit card details on your own server. However, I had all kinds of issues with recurring payments that failed for one reason or another. PayPal doesn’t give you very much of an explanation why a payment failed, but some possible reasons would include the customer’s credit card info (like expiration date) being outdated, an insufficient balance in the customers PayPal account, or an insufficient balance in a checking account linked to the PayPal account. I no longer have access to the numbers because I’ve sold the site, but I think I experienced around 25% of the recurring payments failing for one reason or another, and that excludes payments that were cancelled by customers before they were scheduled to renew. The end result for me was that I chose to not offer monthly memberships because the time it took to track all of the details were not worth the small amount that I was charging per month. If a customer signed up for a monthly membership and then their 2nd or 3rd payment didn’t go through it was a failure. So I only offered longer terms for memberships which meant that if a future payment failed to go through, at least I collected one larger payment at the time the customer signed up. I think some of my problems could have been avoided by offering another payment option aside from PayPal. I believe credit cards would have been a little more reliable with fewer failed payments, so I would recommend that you not rely exclusively on PayPal for collecting membership fees. If you are planning to handle everything related to your membership website you should expect that it will require a great deal of your time. Of course, each site will differ, but in general managing a membership site on your own will be a lot of work. You could offset this by outsourcing some of the work. You could hire someone to handle customer service, to create the content or resources for members, to handle your marketing or social media, or for just about any other aspect of running the site. If you’re starting a new membership site one of the decisions you will need to make will be how much you want to charge. There are several different factors involved here, and I’ll cover a few tips that I’ve learned based on my own experience. I touched on this earlier and I think it is a really important point so I want to mention it here again. Rather than just charging your members a monthly fee for access to your site, offer longer term subscriptions. It could be paying for 3 months, 6 months, a year, or even lifetime access. Personally, I’m not a big fan of offering members the option for lifetime access because it can lock you in to providing customer service indefinitely without collecting any future payments, but it can work well in some situations. When you offer members an option to sign up for a longer term you will want to give them a small discount or some sort of incentive to sign up for the longer term. For example, if you are charging $9 per month you could offer a one-year membership for $99, which equates to getting one month for free. The bigger discount you give for the longer term the more incentive new members will have to sign up for it. When a member signs up for a longer term you are guaranteed to make a certain amount from that customer, even if they cancel before their first recurring payment. For example, a member that signs up at $99 for a year of access and cancels before the first recurring payment would still make you just as much money as a customer who signs up for $9 per month and allows 10 recurring payments to be processed (in addition to the initial $9 charge). Every time a recurring payment is charged the customer will need to decide if they want to continue to allow that recurring payment to be processed or if they should cancel. From my experience collecting fewer, larger payments is better than collecting more small payments. Long-term memberships that are paid up front will also give you the money immediately, rather than waiting to get a small amount each month. You can re-invest that money into making your site more valuable and useful for members, which will result in even more signups. You may want to consider not offering short-term memberships at all. The details will differ from one site to another, but you’ll need to consider the details of your own site. 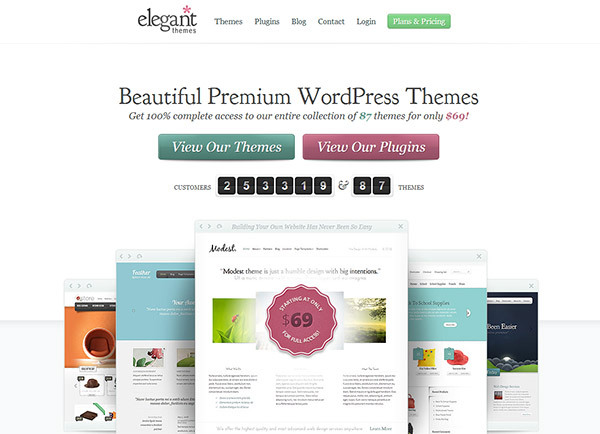 For example, Elegant Themes doesn’t offer any membership options less than a year for their WordPress theme club. One great way to increase your revenue is to offer higher-priced membership levels for members who want to go above and beyond the standard membership. Of course, not all of your members will opted for a higher-priced membership level, but some of them will, and this could make a huge different in your bottom line. In order to be successful with this you’ll need to give members a compelling reason to sign up for the higher-priced level. Elegant Themes is again a good example of this. You can sign up for a standard membership for $69 per year, or your can opt for the developers membership and get some additional benefits (including access to plugins) for just an additional $20 per year. When it comes to pricing you will want to give it plenty of consideration, because it can be a little tricky to make changes to your pricing in the future. I recommend that you start low because it is easier to increase prices of your membership levels than it is to lower your prices. If you decide after running your membership site for a year that you priced it too high and you need to lower prices you will be faced with some challenges related to how you manage your existing members. With some recurring payment processors (including PayPal) you cannot make adjustments to the details of a recurring payment (like the price or the frequency of the payment) after it has been set up. So if you want to lower the price that your current members are paying you will need to cancel their existing recurring payments and have them sign up again at the lower price. If you do this you will inevitably lose some members as not all of them will make the effort or decide to sign up again, even if the price is lower. The other option is to lower your pricing for new members and continue charging your existing members the higher price. I wouldn’t recommend this because it is likely to annoy your existing customers and result in a lot of cancellations. It’s much easier to increase prices for new members. When most membership sites increase prices the increase will not affect existing members who will continue to be billed at the rate that they signed up for. This means that if you increase your prices you will be making less from those older members, but it also gives them some incentive to keep their membership active. If they cancel and then decide later to come back they will need to sign up at the higher price. Starting with a lower price also gives you the chance to build your customer base faster and to establish your reputation in the niche or industry before increasing prices. 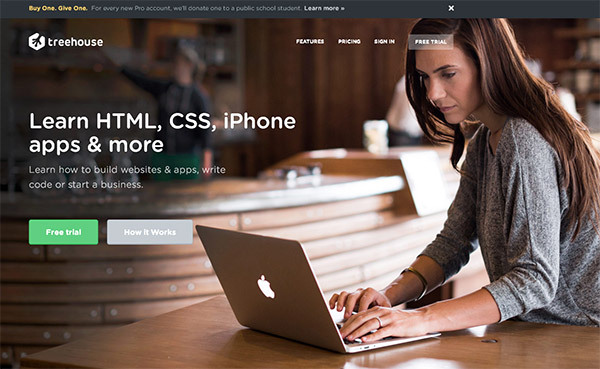 Again, Elegant Themes is a good example here. When Elegant Themes launched they charged $19 per year for membership. As the number of themes in their collection grew, and as they developed a reputation in the WordPress community, the price for new members increased to $49 per year, and then it recently increased again to $69 per year. Along the way the also started offering the developers membership for $89 per year and the lifetime membership for a one-time payment of $249. Based on my experience with a lot of failed recurring payments through PayPal I would recommend allowing members to sign up and pay with a credit card through some processor other than PayPal. I would probably still offer PayPal as an option because some customers will prefer to use it, but having some customers using other payment gateways could result in better reliability for the recurring payments. Within the past few years it has become much easier to set up the technical details of a membership website. In order for your site to function efficiently you will need to be able to accept signups and payments from new members, have member accounts created during the sign up process, have members-only content automatically protected and blocked from non-members, collect recurring payments, and automatically cut off access to members who cancel their payments. Several years ago aMember was one of the few reliable platforms that was available, so most membership sites were set up using aMember. Within the past few years a number of different WordPress plugins have been released, or have increased in popularity. aMember is still a viable option, but the set up is more involved and complicated when compared to installing and setting up a WordPress plugin. In this section we’ll look at some of the technical details that you will need to consider. When you are starting your membership site you may be in a hurry and just want to quickly pick a platform to manage the memberships, but this decision can come back to haunt you later. It is critical that you take the time to evaluate your options and choose a platform that you believe will meet your needs for the foreseeable future. It can be extremely difficult, and in some cases impossible, to move from one platform to another without having significant impact to your existing members, so be sure that you start with a platform that you want to use for the long run. Since there are a lot of different WordPress plugins that you can use for membership you may think that you could simply move from one to another without much difficulty. The most challenging part comes in dealing with the existing recurring payments that are set up for your members. Each plugin or membership platform will deal with recurring payments differently and if you move from one to another the integration with existing recurring payments can be damaged. For example, your new platform may not be able to tell if the recurring payments for your existing members are being processed, so it may cut off access to members who are still paying or it may grant access to other members who have cancelled. There are some situations where changing platforms is possible (I know a few years ago Restrict Content Pro had a plugin to help with moving from aMember, but I’m not sure if that is still available), but in general it will be complicated and sometimes not even possible. And if you do move you will be risking issues with recurring payments from your existing members. Since moving from one membership platform to another can be so complicated you will want to be sure that you select a plugin or platform that will continue to work and be actively maintained well into the future. Personally, I would be very hesitant to choose any new membership plugin or platform because I want to see some stability in order to have confidence that it will be around for several years to come. Many WordPress plugins are abandoned or poorly supported, and you don’t want to be stuck using one of these for a membership site that is making money for you. Fortunately, there are some good options that have proven to be stable for several years. aMember continues to be a leader in the industry. aMember worked well for me, but I wouldn’t choose it if I was starting a new membership site for two main reasons: 1) it’s a little bloated and can add unneeded complexity, and 2) it adds an extra layer outside of WordPress. When I used aMember it took a LONG time for them to release a new version of aMember that was compatible with a new version of WordPress. They had a beta version of aMember that they said worked fine, but they didn’t recommend using it on live membership sites. So I was stuck not upgrading WordPress for a long time while waiting for aMember to release a stable version that was compatible with the new version of WordPress. Since aMember can be used with many different content management systems, keeping integration with WordPress is just one of their priorities, and in my opinion it took WAY too long to release a version of aMember in response to the WordPress update. Membership plugins that are created specifically for WordPress will be updated almost immediately if changes are need to stay compatible with WordPress because that is there only integration. In the end, aMember worked for me, but it was inconvenient and it made a lot more work when I had to upgrade later. I have used several different membership plugins over the years in test scenarios, and also on client websites. The two plugins that I like the best are Member Mouse and Restrict Content Pro. Both have a proven track record of at least a few years, both have a solid company/developers behind them, and both are very well supported. 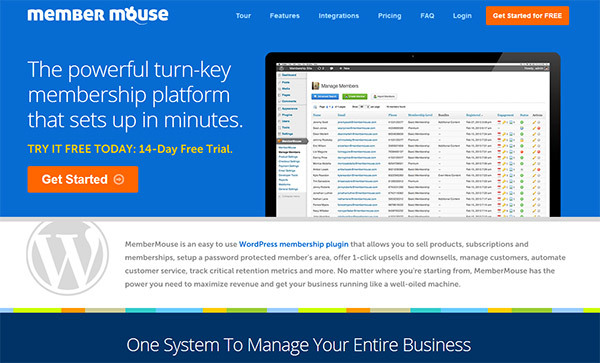 Member Mouse is a feature-rich membership platform that can do just about anything you would need. It includes features like one-click upsells, downsells (to retain a member when they go to cancel their account), dripped content, trial memberships, and a very nice user interface. The downside to Member Mouse is that it involves a monthly fee instead of a one-time fee, but in my opinion the cost can be easily justified. Pricing starts at $19 per month for a site with up to 1,000 members, a price that can be easily afforded by most active membership sites. The benefit of making a monthly payment is that it helps to keep Member Mouse profitable, which is also in your best interest as a user. Since the company is able to collect monthly fees from users they can dedicate more resources to providing customer service and to keeping the plugin updated, which gives me more confidence that it will be around well into the future. Restrict Content Pro does not offer as many advanced features, but it is a very reliable and simple option. It’s very easy to get a membership site set up with RCP, and it’s also very cost effective, starting at just $42 for a single-site license. There are several other popular membership plugins like Wishlist Member, S2 Member, and Digital Access Pass among others. I haven’t used S2 Member or Digital Access Pass, but I didn’t have the greatest experience with Wishlist Member. I originally tried to use it on my membership site when I was setting it up several years ago, but I had issues with it not working properly (specifically, it wasn’t cutting off access for members who had cancelled) and I found the customer service to be sub par. I also worked with a client that used Wishlist Member for a few years. It worked ok for her, no major issues, but wasn’t as user friendly as Member Mouse or Restrict Content Pro. Just like with any other type of website, you’ll need web hosting in order to set up your membership site. You won’t need anything special from a web host in order to have a membership site unless you want an SSL certificate for security reasons, and just about any host will offer SSL certificates. If you are using PayPal or another payment gateway that processes payments on their own server (rather than on your site) you will not need the SSL to protect customer credit card info. If you do choose a payment gateway that processes payments on your site and stores credit card info anywhere on your server you will absolutely need an SSL certificate. ProfitBlitz is hosted with SiteGround and I highly recommend their hosting (read my full SiteGround review here). I also have a VPS from LiquidWeb for one of my larger sites and they are excellent as well. You could also go with shared hosting from someone like BlueHost or HostGator if you are looking for low cost shared hosting. You don’t have to use WordPress for your membership site, but with several good membership plugins to choose from, a huge number of themes available, and plenty of hosts that make it easy to install WordPress, there really aren’t many reasons why you wouldn’t want to use WordPress. Your membership website won’t need any specific type of theme, just about any theme can be used for a membership site since the membership functionality will be handled by a plugin and not the theme. You can choose basically any theme you want. Personally, I like the Genesis framework and the Genesis child themes from StudioPress, Elegant Themes, Theme Trust, and the themes from MVP Themes at ThemeForest. Any of these themes can be purchased for less than $100, or there are countless free themes that you could use. Since you will be charging members for access to your site I recommend that you purchase a premium theme that will give your site a professional appearance rather than trying to save money by going with a free theme (but there are some decent free themes out there, you’ll probably just need more time to find the right one). Another significant decision is what payment gateway you want to use. In my opinion you should first decide on the platform or WordPress plugin that you want to use to manage the memberships, and then choose a payment gateway based on the integrations offered by that platform or plugin. Each platform or plugin will have its own list of payment gateways that it will integrate with, and choosing the right platform is a little more critical, in my opinion, than choosing a specific payment gateway. Of course, you’ll also need to set up your site to protect your members-only content. Each platform or plugin will have it’s own process for protecting content, so check their instructions. In most cases it is very simple, something like checking a box in the post editor screen in the WordPress dashboard to protect a page or post. And most platforms also have a short code that you can use to protect specific content. You might use this in a case where you want a page to be publicly visible, but you want a download link or a video player to only be visible to active members. So far we have looked at the different types of membership sites, the pros and cons of the membership model, pricing tips, and the technical details of setting up a membership website. Now let’s turn our focus towards actually making money with your site. In this section we’ll look at some of the best things you can do to get new member signups. One of the most effect strategies is to use a free membership level or a free trial in order to entice people to try it out. The difference between the two is that a free membership level will give the user a limited amount of content or resources, but for an unlimited length of time. For example, if you have a membership site that 10 different free photography courses to paying members you might set up an additional membership level that would allow people to sign up for free and access 1 of those 10 lessons. The access wouldn’t be limited to one month or to any other set amount of time. The user could create the free account, access the 1 course for free, and if he/she wanted to get access to the other 9 courses upgrading to the full paid membership would be possible. A free trial on the other hand would give the user the same access as a paid member (in most cases) but only for a limited amount of time. So in this example the trial would allow the user to access all 10 of the courses for 7 days, or some other set amount of time. Sometimes the free trial requires the user to sign up for the recurring payment, and the billing will begin automatically at the end of the free trial unless it is cancelled. Both free membership levels and free trials can be effective ways to encourage your target audience to give your site and your content a try with no risk involved. If the content of the site meets the users expectations you may be able to convert them into a paying customer. If you are trying to decide between offering a free membership level or a free trial, think about the specific details of your site. What type of content or resources are you offering? How quickly will the user be able to download or consume the content? You’ll want to avoid a situation where the free membership or trial will give the user everything needed and give them no incentive to continue with the paid membership. For example, a site like WeGraphics that offers downloadable resources for designers would not want to offer a 7-day free trial with full access to all of the products on the site because the user could sign up for the trial, download everything on the site, and then have no need to continue on with the paid membership. WeGraphics would be better off setting up a free membership level that isn’t limited to a specific amount of time but offers users the ability to download a few select products/resources rather than giving full access. That way the user could try out the quality of some products but would need to upgrade to a paid membership in order to get full access. If your membership site offers a huge volume of content that users wouldn’t be able to consume during a short-term free trial, that may be the way to go. As an example, a site like Treehouse with hundreds or thousands of different video courses available could offer a free trial with 14-days of unlimited access because the user would never be able to get even close to watching all of the instructional videos. Continuing on with the paid membership would be the only way to get more of the content. Of course, if you are doing something similar you will want to make sure that free trial users will not be able to download videos for watching after their free trial. Instead, only allow the user to watch the videos at your site so you can prevent excessive downloading during a free trial for watching later. Combining email marketing with a membership website can lead to amazing results, especially if you are taking advantage of the ability to email people who sign up for the free trial or free membership level. Most membership plugins or platforms will integrate will email marketing provides like GetResponse and AWeber so that when a user signs up for a membership (whether it be paid, free, or a free trial) he/she is added to your email list. The combination of a free membership level and an effective autoresponder sequence is one of the most powerful ways to build a profitable membership website. 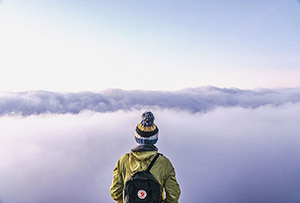 In general, users will be more likely to sign up for a free membership level than to sign up for a free trial, because the free trial will typically involve the payment details and require the user to cancel if they don’t want to continue. Most users would rather not have to enter payment details until they are sure they want the membership access. So with this in mind, a free membership level will likely allow you to build your email list faster than a free trial. You could create a series of emails to go out over a period of a few days, weeks, or even months after a user signs up for a free membership. With the emails in that autoresponder sequence you can promote your paid membership plans and keep your site in front of an audience that has already shown an interest in what you have to offer. In some cases you may even want to use the autoresponder emails to give an exclusive discount or some other incentive for signing up for a paid membership. Think about the recurring payments that you make each and every month. You probably have a mortgage or rent payment, electricity, cell phone, internet access, cable or satellite TV, car payment, apps/software/services that are essential to your business (like web hosting), and maybe one or a few subscriptions to things that you enjoy. If you take a look at the things that you are willing to pay for month after month you’ll probably notice that they are all essential, essential to your lifestyle, or something that you really enjoy. If it doesn’t fit into one of those categories you are probably not willing to pay for it month after month. With this in mind, think about how your target audience will view a membership to your site. In order to maximize your success you’ll need to be able to create a site that offers something to users that is essential to them or to their business. If not, you’ll likely struggle to convince people to sign up or to stay as an active member. If the content or products that you are offering through your membership site are not essential to lives or the business of your members you will need to target what you are offering to a very specific user with a strong passion for what they can get from your site. Early on in this article I mentioned EPSN Insider as one example of a membership website. While sports information is not exactly essential to most people, there is a huge audience of people who play fantasy football and most of them are extremely passionate about it. Many of these people would be willing to pay a small monthly fee to get access to insider info that can help with their own fantasy team. When it comes to making your site essential, keep in mind the time is essential to almost everyone. So if the content or resources available through your site can save lots of time in some way for your members, that can be essential. Blog posts can be a great way to promote your membership site, especially if you already have an existing audience for your blog. With a blog post you can go into detail about the content of the membership site, what members will get access to, what is offered in the free membership or free trial, and in some cases you can even publish tutorials that complement the info or resources available to members. Blog posts can not only be useful for communicating with your existing audience, but they can also promote your membership site for months and years to come as the posts are found through search engines, social media, and links from other sites and blogs. In addition to publishing posts at your own blog you can also use guest posts at other blogs to promote your site. You can link to your site in the author bio or in the body of the article if it is relevant to the content of the article. If you offer a free membership level guest posts can be a great way to get the word out. Think about some post topics that you could write about that would allow you to naturally mention the free content or resources available at your site. Links within the article body will generally result in a lot more clicks than links in the author bio. If you want to drastically increase the reach of your site you could start an affiliate program and allow others to promote it in exchange for a commission on any paying members that they refer. Member Mouse integrates with iDevAffiliate to allow you to set up and manage your own affiliate program. I’ve been using iDevAffiliate for over a year with one of my sites and I have been happy with it. Restrict Content Pro can be integrated with the Affiliates WordPress Plugin to set up and manage your affiliate program. Unless you have a large existing audience for your site you will probably need to actively recruit some affiliates. You can also encourage your members to promote your site as an affiliate. What’s Your Experience with Membership Websites? If you have experience managing a membership website and you have anything you would like to share please feel free to leave a comment. And if you have any questions please feel free to ask and I will do my best to answer it.